​like a body to a hand. and you braided her hair. It never rained. SHAKTHI SHRIMA's work appears or is forthcoming in the Berkeley Poetry Review, the DIALOGIST, and Muzzle, amongst others. Shakthi Shrima appears or is forthcoming in her unmade bed. 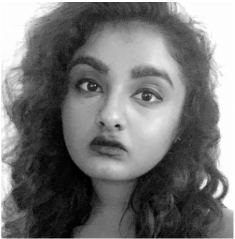 She works with Winter Tangerine as the Associate Editor of Spotlights, and is presently a student at Princeton University.